Man City continue their quest for an unprecedented quadruple with penalty shootout success. 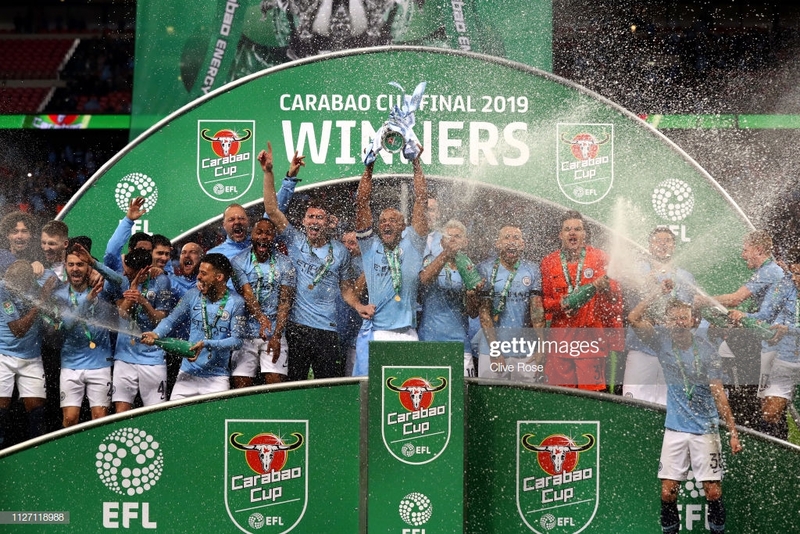 Manchester City squeezed past a valiant Chelsea to win the first silverware of the season in a match that will be remembered for a remarkable argument between Maurizio Sarri and his goalkeeper Kepa Arrizabalaga at the end of extra-time. With Chelsea opting to push their wide players, Willian and Pedro, back into a more defensive role underpinning a 4-5-1 formation, the opening half of the Cup final was a tense and cagey affair. Sarri had clearly prepped his side not to take any chances following the 6-0 drubbing only a fortnight ago, reflected in his decision to pick Emerson at left-back ahead of the more offensive Marcos Alonso. City looked to probe and patiently pick their way through the Chelsea banks of four and five but opportunities were few and far between - the chess-like nature of the contest was evidenced by David Silva being the only player to have a touch in the opposition’s penalty area during the opening 15 minutes. City themselves were wary of pushing too many players forward and were given a warning when their back four found themselves exposed by a David Luiz punt over the top only for Oleksandr Zinchenko to escape a possible red card when he brought down N’golo Kante - albeit such a decision would have been a harsh one. Meanwhile, the favourites were limited to a couple of snapshots by Sergio Aguero, despite predictably enjoying more territory than their opponents. If anything, Chelsea’s best opportunity of the half was manufactured in the final few seconds when Nicolas Otamendi headed just wide at his own end - a lack of communication caused the centre-back to panic when defending a free-kick despite no pressure being applied. 0-0 at half-time, a small victory for Sarri? The second half started with a bit more zest and City looking to force the issue. Aguero was just inches away from connecting with a Kevin De Bruyne cross but appeared to take his eyes off the ball at the last second. Yet Pep Guardiola’s side thought they had broken the deadlock with a typical Aguero finish just before the hour mark. Otamendi headed a ball back to the Argentine from a half-cleared corner before Aguero swivelled and finished beyond Kepa only for VAR to give the decision marginally offside. Chelsea were still happy to play a containing game, knowing the pace of Eden Hazard would cause problems for Otamendi and Vincent Kompany who replaced the injured Julian Laporte at half-time. Breaking onto a long ball, the false nine burst away from the Chelsea back four before pulling a pass back to Kante from the byline. Yet the Frenchman could only scoop over from close range...the finish of a defensive midfielder? The game was finely poised going into the last 20 minutes but the tension was clear for both shades of blue. Ross Barkley fired over for the darker shade before De Bruyne whipped a free-kick from a dangerous position way off-target. Both sides were crying out for a quality final touch...yet the late introduces of Reuben Loftus-Cheek, Callum Hudson-Odoi and Leroy Sane could not make an immediate difference. Though Willian did force Ederson to tip over his free-kick from the angle during injury time. If anything, Chelsea looked the more likely side to hit the back of the net at the beginning of the extra 30 minutes. They were particularly spritely down the right through Hudson-Odoi but a couple of half openings were blazed over by his teammates. On the ropes, City responded after the break and went the closest of either side throughout the entire contest. Raheem Sterling wriggled his way through a couple of challenges before pulling the ball back to Aguero. Under pressure, City’s main marksman looked to slide the ball into the back of the net past the committed Kepa but a slight deflection off Cesar Azplicueta just about allowed Chelsea to hook the ball away from underneath their crossbar. With minutes remaining, City broke clear from the midfield through Sane. A slip from Antonio Rudiger allowed the German to power on and the ball fell to Aguero who looked to curl his strike past Kepa...only for the Spaniard to stretch out an arm and keep City at bay. Yet that seemed to be the end of the goalkeeper's final, moments before penalties, with a combination of the last two chances appearing to force him off with injury. Enter former City goalkeeper Willy Caballero ...or so it seemed before Kepa refused to come off much to the fury of Sarri who started walking down the tunnel in an extraordinary turn of events. Was Sarri looking to make a tactical swap in the belief that Caballero was the better penalty stopper than Kepa? There was only one way to find out who was right as Caballero gave his teammate daggers before the spot-kicks. After a tough few months, Chelsea were 12 yards away from proving their doubters wrong. Yet the heavily criticised Jorginho saw his weak effort saved by Ederson. Ilkay Gundogan put his effort away before a fine strike from Azplicueta into the top corner. Aguero then just about slid one under Kepa that should have been saved. Should he have listened to his manager ten minutes previous? Emerson levelled at 2-2 before Sane saw his strike parried away by Kepa. Redemption of sorts...only for another Chelsea player under pressure, David Luiz, to hit the post. Bernardo Silva converted and all of a sudden City were within touching distance. Hazard kept his cool to clip his penalty over Ederson before Sterling secured the first trophy of the season for City with a perfect strike. Heartbreak for Chelsea who put in a great display of teamwork before the Sarri-Kepa argument...was that the moment that cost them the Carabao Cup?